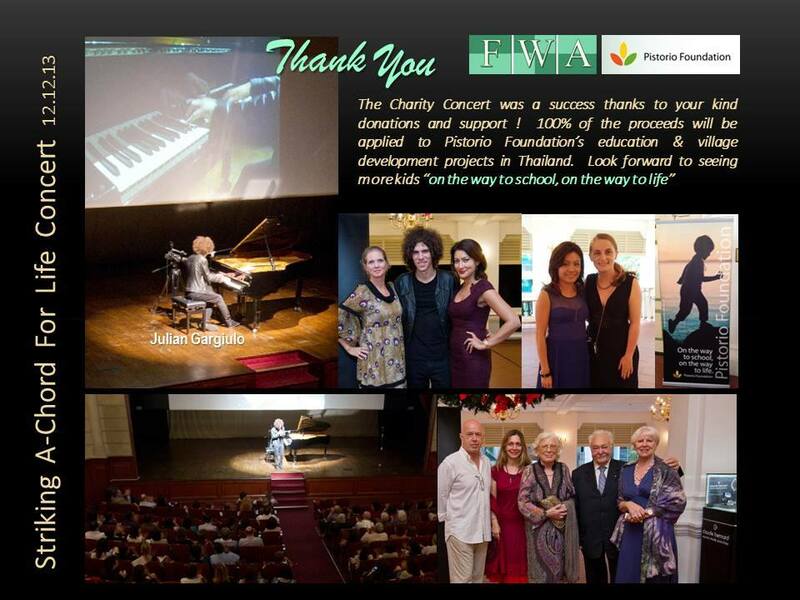 We are very fortunate to have had famed pianist Julian Gargiulo from Paris perform once again to benefit the Pistorio Foundation on December 12 in Singapore, in a concert organized by the Financial Women’s Association of Singapore (FWA). Held at the iconic Raffles Hotel Jubilee Hall, the well-attended concert successfully raised over 21,000 SGD for the Pistorio Foundation’s Scholarship programmes. Julian enchanted the audience with classics such as Chopin’s Etude Opus 10 No.12, Beethoven’s Sonata Opus 27 No. 2 in C-Sharp Minor “Moonlight Sonata”, and a few of his own original compositions, Toccatina and Piano Dance. Paris-based Julian, who is almost a regular in the Singapore music scene, regularly performs in venues such as Carnegie Hall, the United Nations, Moscow Conservatory Hall, and Sydney’s Seymour Theatre Centre. Hosted by BBC’s Sharanjit Leyl, the event’s distinguished guests included also the Foundation’s Founder and President Pasquale Pistorio, FWA President Chin Loo Low, the Italian Embassy’s Deputy Chief of Mission, Mr. Gianluca Rubagotti, as other friends of the FWA and the Pistorio Foundation. Another highlight of the evening was the raffle draw with fabulous prizes from sponsors including: 3 Nights Stay at 1 INDIAN OCEAN, Bentota, Sri Lanka; a Villa stay at AMALA DESTINATIONS, Ubud, Bali; custom made clothing from ZARDOZE and from Q MENSWEAR; dining vouchers for MARUKYU, CLUB VIVRE, ROYAL MAIL; a watch from CLAUDE BERNARD; jewelry from ROSSO PREZIOSO and AUTIUM; and other valuable prizes. Other event sponsors included: Harper’s BAZAAR, System Sovereign Creatives, Kim Robinson, Space & light yoga, Certain Cellars, Lolla, and Peachy Pixx photography. We would like to thank whole heartedly FWA for their support of the Foundation, all the guests who attended the event, our generous sponsors and the many volunteers who contributed to make the event possible!